You’ve heard of Wonder by RJ Palacio, yes? Perhaps you read Wonder aloud, or your kids have read it independently, or in the classroom. Wonder, with its message to “Choose Kind,” has captured the hearts of kids and perhaps even sparked a fire within those young readers to search out other books that will make their hearts beat stronger. I’ve curated this book list for kids who enjoyed Palacio’s book, keeping in mind the themes that people love about Wonder. These books explore the importance of kindness towards others, as well as towards oneself. The stories encourage kids to get to know others who are different than themselves, to treat others with compassion and respect. They are coming of age stories for early adolescence and seeing yourself as more than your outsides. They teach kids to look beyond the surface, to explore their strengths and see what they are really capable of. 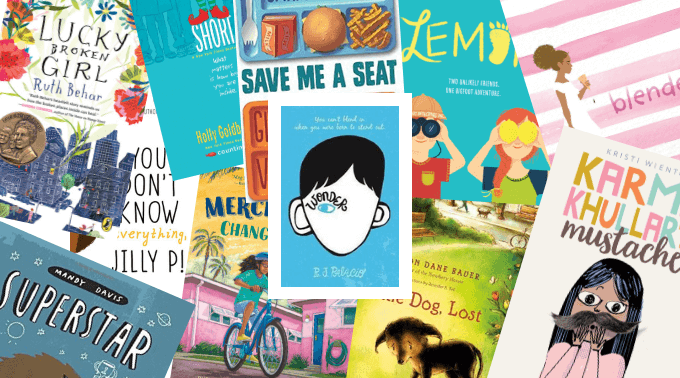 So if you loved Wonder, try one of these books next! 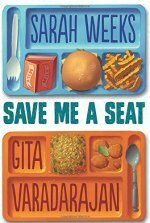 Save Me a Seat by Sarah Weeks and Gita Varadarajan. This funny and touching story of Ravi, an Indian immigrant adjusting to middle school and Joe, a boy who recently lost his best friend due to a move, is told in alternating voices. The two boys become friends when they unite again a school bully and one seriously crazy week full of laugh out loud humor ensues. You Don’t Know Everthing, Jilly P. by Alex Gino. Jilly P. is learning about the way the world treats individuals differently and how she can be part of the solution. She befriends a fellow fantasy book fan, Profound, who is deaf and black and when Jilly’s sister is born deaf she starts to learn about Deaf culture and how her sister’s whiteness makes her different that Profound. Her black aunt encourages her confront racism, even though her parents want to ignore racial tensions, both in the family and in society. Jilly is an eager student and is a positive role model for kids to learn how to support marginalized people. Short by Holly Goldberg Sloan. Julia is short for her age and one summer she lands a role in a local production of The Wizard of Oz. While playing the part of a munchkin, she befriends several adults with dwarfism as well as her artistic neighbor, Mrs. Chang, who just happens to be a whiz at costuming. Through her new friendships and performing experience, Julia’s world bursts wide open. I adored all the theater references in this book! Lucky Broken Girl by Ruth Behar. In the 1960s, Ruthie and her family are recent Jewish-Cuban immigrants living in New York City. After a car accident, Ruthie suffers terrible injuries and she is placed in a full body cast. Confined to bed and totally dependent on others, Ruthie’s physical world narrows, but as others come to visit her, Ruthie begins to collect stories and her emotional and intellectual world expands. The author based the story on her own experiences and this is a wonderful, moving book. Blended by Sharon M. Draper. I always know when I see a new book from Draper that I should read it right away because it is bound to be excellent! And Blended lived up to my expectations. Isabella is trying to figure out who she is and she feels torn between two identities. Her divorced parents, a wealthy black father and a working class white mother, share custody and Isabella spends alternate weeks at her parents’ homes. A distressing even at school makes immediate Isabella’s search for identity when she knows her sense of self is so much more complicated that the world perceives. Lemons by Melissa Savage. Lemonade Liberty Witt has just lost her mother and has come to stay–perhaps temporarily, perhaps not–with her grandfather, Charlie. She meets Tobin, a quirky boy who investigates Bigfoot sightings. Lemonade learns that Tobin is ostracized by the other kids, who welcome her into their group. But Lemonade also wants to be friends with Tobin. With the help of her grandfather and others in the community, Lemonade learns how to bring the kids together and finds her place in a new home. Merci Suárez Changes Gears by Meg Medina. This heartwarming and funny book tells the story of Merci, a sixth grader Cuban-American who lives with her big, intergenerational family in three side-by-side pink homes in Florida. Merci is a scholarship student at a private school and she is hoping to earn enough money this year to buy a bike, but because of a tussle at school she is now volunteering her time as a Sunshine Buddy to a new boy, which puts her in the cross-hairs of a “Queen Bee” at school. At home, Merci’s beloved grandfather shows the beginning stages of dementia which upends her home life. Confessions of an Imaginary Friend: A Memoir by Jacques Papier by Michelle Cuevas. The story is narrated by an imaginary friends who goes through an existential crisis when he finds out he is imaginary. He goes on a soul-searching journey as he is assigned to different real-life friends, and makes the acquaintance of other imaginary friends, even joining a support group. There are some rather deep questions about existence and the meaning of life in this book, but it is also incredibly funny and touching, and one of the most unique books I’ve read in a while – and we also love the audio book! 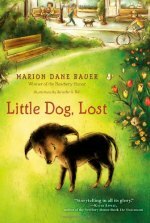 Little Dog, Lost by Marion Dane Bauer. I have had more people write to thank me for introducing them to this book than any other title in my book lists. It may not seem a likely candidate for a book list for kids who liked Wonder but read it and you’ll see why it’s a good fit! Little Dog, Lost is an utterly charming story. Three plot points–a boy who needs a dog, a dog who needs an owner and a neighbor who needs a friends come together in an extremely satisfying story. Written in verse, I highly recommend this as a read aloud. The story is heartfelt and engaging while still providing kids (and parents!) the opportunity to contemplate and discuss ideas like the importance of community and companionship. The Best Man by Richard Peck. This author is well known for his book, A Long Way From Chicago. This book is full of the same trademark humor. Archer looks up to a few men in his life and tries to learn from them: his grandfather, his dad, his uncle Paul and his teacher, a former military man. His relationships with these men help him navigate the peril that is living on the edge of adolescence as he deals with friendships, bullies and general kid stuff. Then, his uncle and teacher fall in love and Archer’s world view expands even further. What’s the recommended age range for most of these books? As read-alouds? 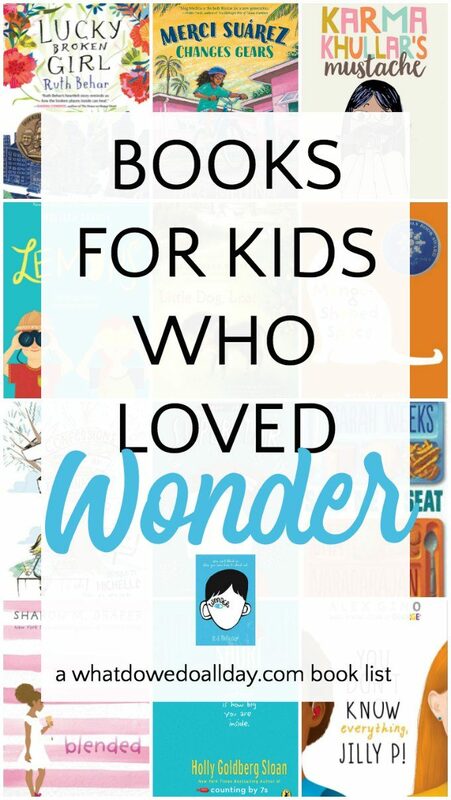 Loved Wonder, and would love to read some of these others, but curious when is the right age for kids to hear it. They are all recommended for the same age group that Wonder is recommended for, which is 8-12.